Enough of rest and relaxation. Jump in again, strong. Re-branding and revising, making products new. 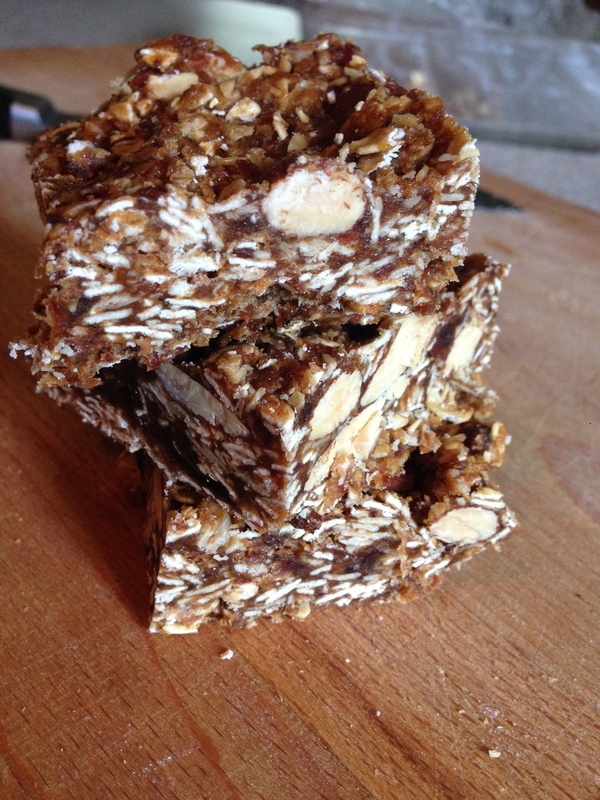 Get out that new propolis! Let’s start our new brew! With hustle and bustle of the holidays behind us, the Saums and Dotsons are anxious to use these next few cold months of winter to reflect on and refocus our efforts to bring amazing bee products to the public. We have decided we want to re-brand our company to focus more on the bees and the “BEE POWER” they can provide to our health. We also want to re-formulate some of our products to improve them, evaluate the demand for individual products, review customer feedback and decide on products to add, change or drop. We also will be looking for new stores to carry our product and new venues to attend in the spring, summer and fall. ingredients, so we can make products to replenish our supply! 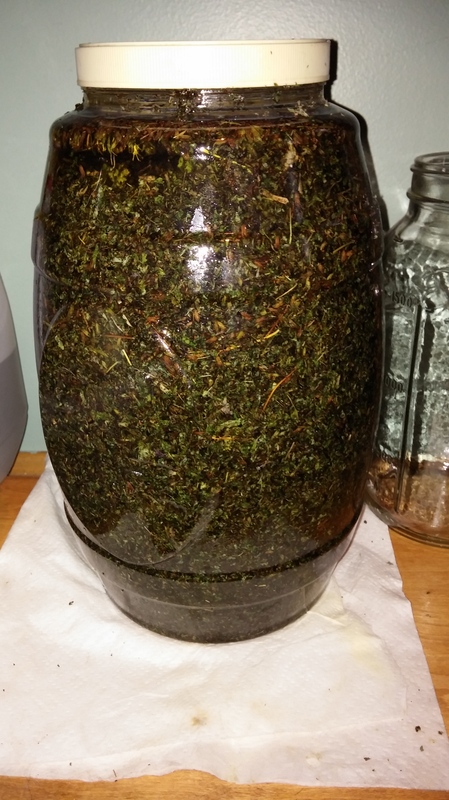 We spent a night in December, processing our dried, home-grown herbs used in our soothing and healing oils. 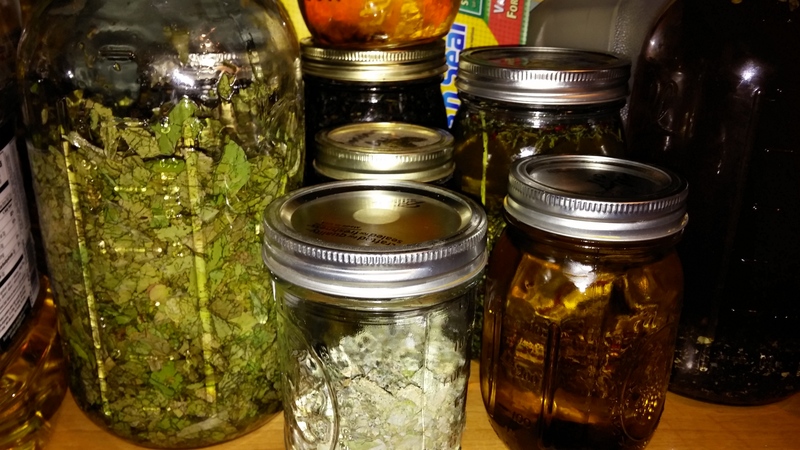 We sat on tarps in the Dotson’s living room and rubbed bags full of herbs through screens to crush into little pieces and then put each kind into big mason jars. 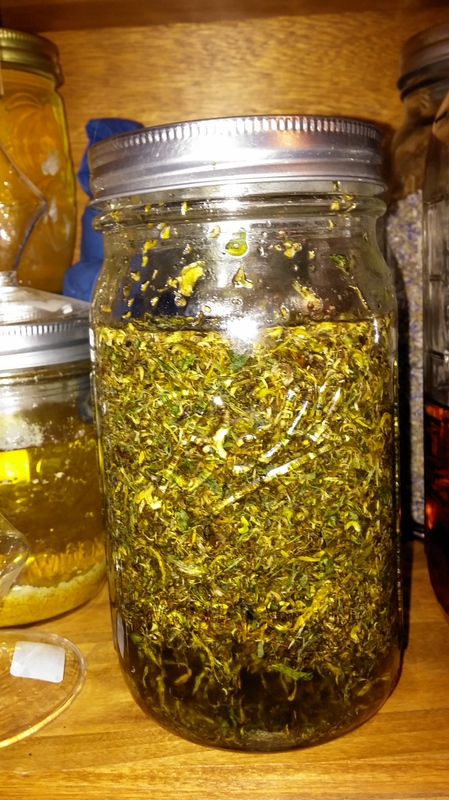 And now that we have lots of golden, healing propolis, we can get down to business, mixing up our brews. Laurie and Jeannie got together on New Year’s Eve day to start brewing. 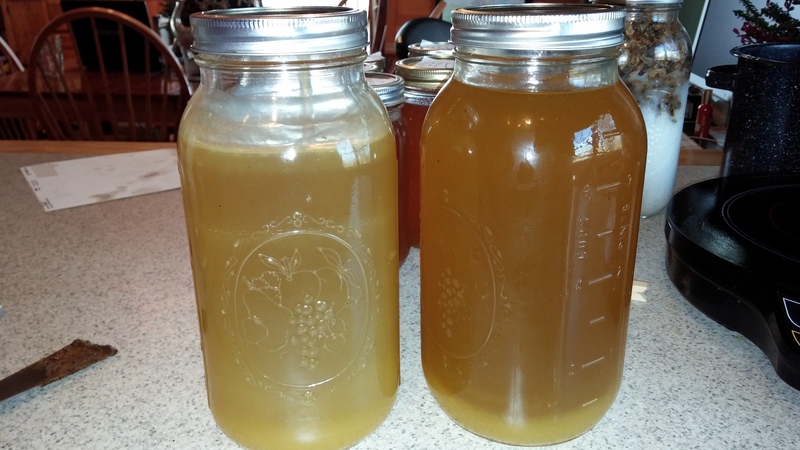 (Jeannie had already started 3 big jars of propolis in vodka last week, which must be soaked and shaken every day for at least 2 weeks, to make our propolis tincture.) We started the day infusing propolis in olive oil using our induction cooking burner, which keeps the oil at a constant temperature. 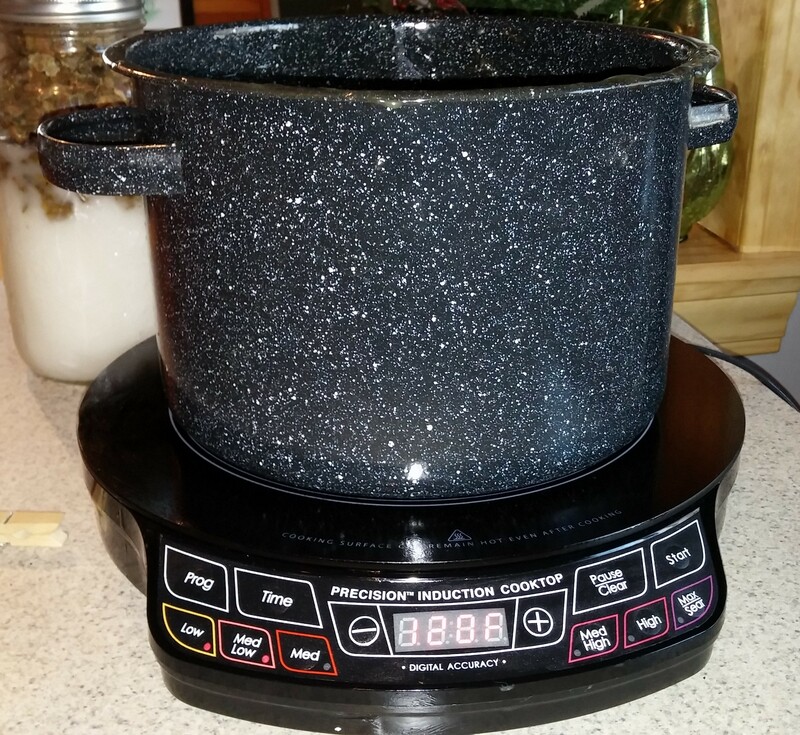 We mix propolis and oil in a ratio, by weight and heat to 120 degrees farenheit for 20 minutes. Then we pour through organza to strain. Now we have 2 big jars of wonderful propolis oil. 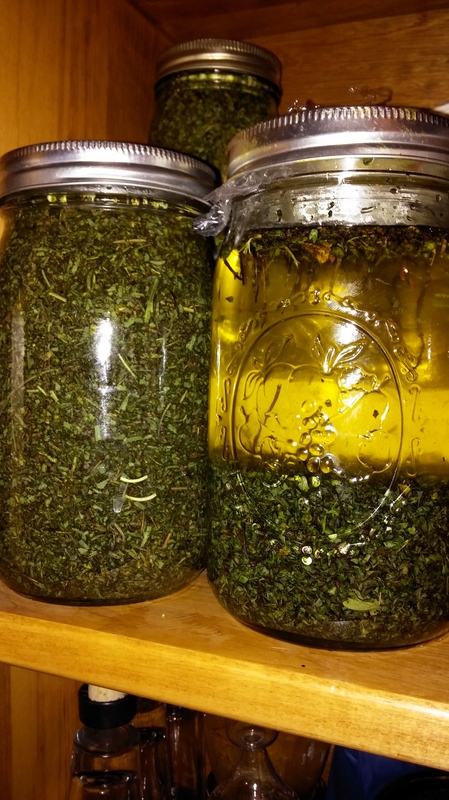 Next, we started our herbal oil infusions, by measuring our dried herbs by weight and pouring (measured) olive oil over them in the mason jars, to cover. We set these herb-oil mixtures on a shelf and will shake them every day. 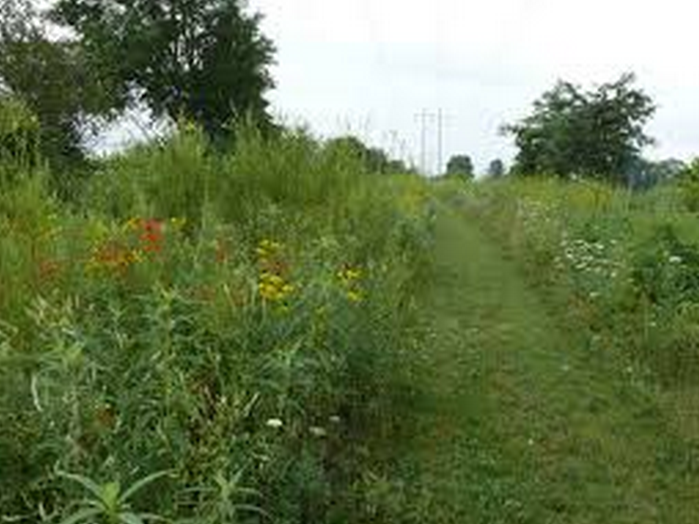 We’ll let them sit for a month or two and add more plant material as it becomes available, if we decide it is needed. Then we will mix these herbal oils together to make our special soothing and healing oils to use in our skin care products. It’s fun and rather awe-inspiring to work with the Creator’s gifts! 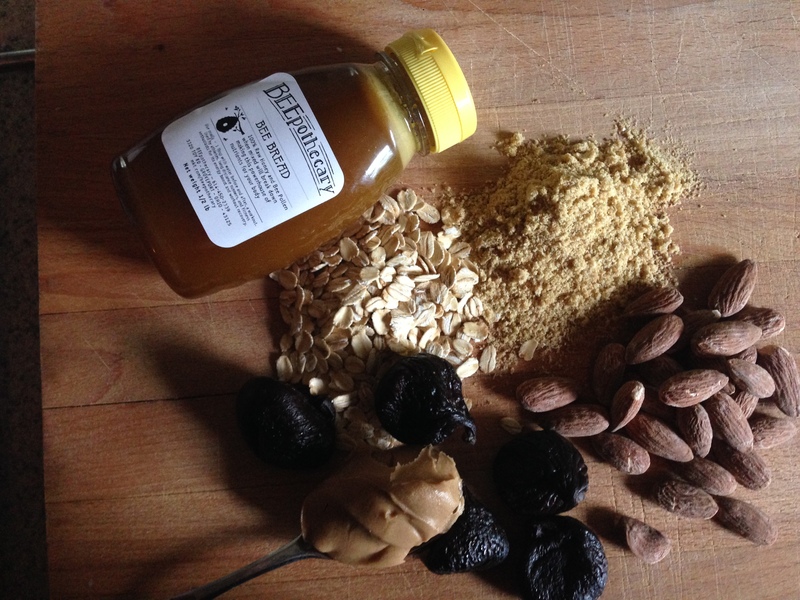 We love it when we talk to people who have had improved health results by using propolis – our products or any others. It affirms our amazement at the remedies God has given us in nature. 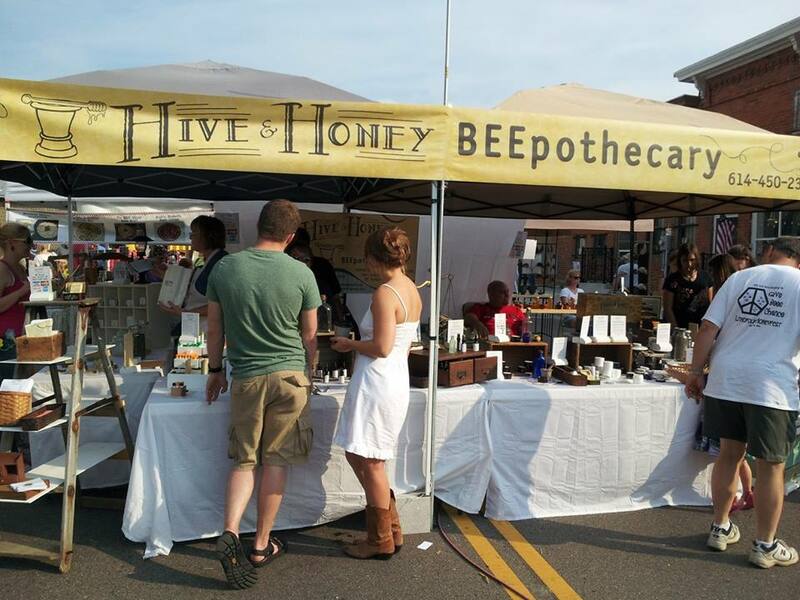 On the second day of the Lithopolis HoneyFest, we had two-day one customers come visit us again, to tell us how well the propolis product they had bought the day before had worked! 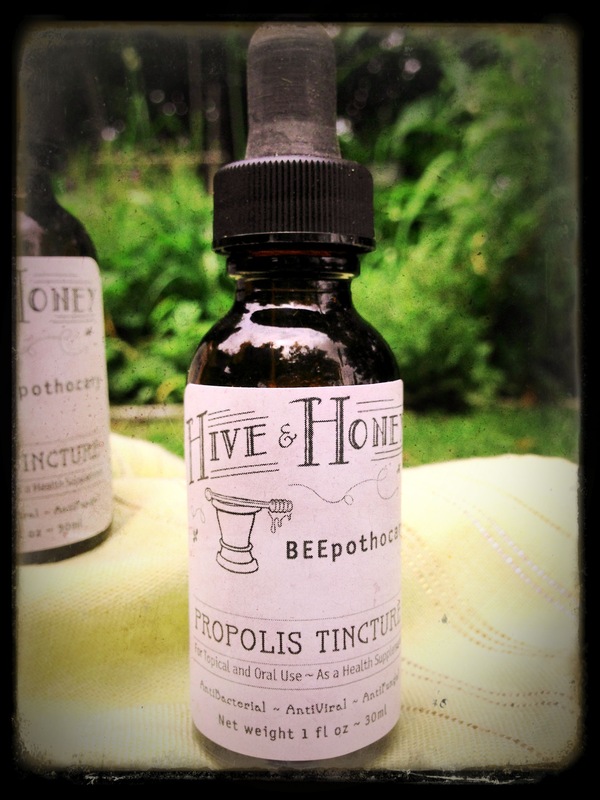 One gentleman said the propolis throat spray had gotten rid of his almost year-long irritated throat, overnight! Another man named Jim came back Saturday to tell us he had used our Propolis Saline Nose Drops the evening before and for the first time in months, his sinuses were clear. He came back to buy more! 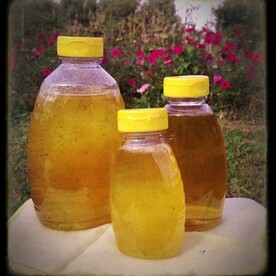 We are thrilled when customers have the same successes we have had with honeybee propolis. Last weekend, we had a booth at the Columbus Oktoberfest, where people come to pay $16 for a mug of beer and $8 for a brat! 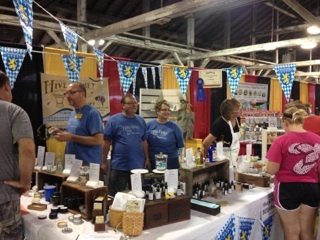 Amazingly, despite the focus on beer and brats, we were able to turn people on to the wonders of propolis. One family spent a long time learning about it from Laurie and Peter, but weren’t ready to buy. Their preschool-age son with them wasn’t feeling well due to an ear ache. Laurie offered to put prpolis oil in his ear and told them to go enjoy the festival for a while and see what happened. 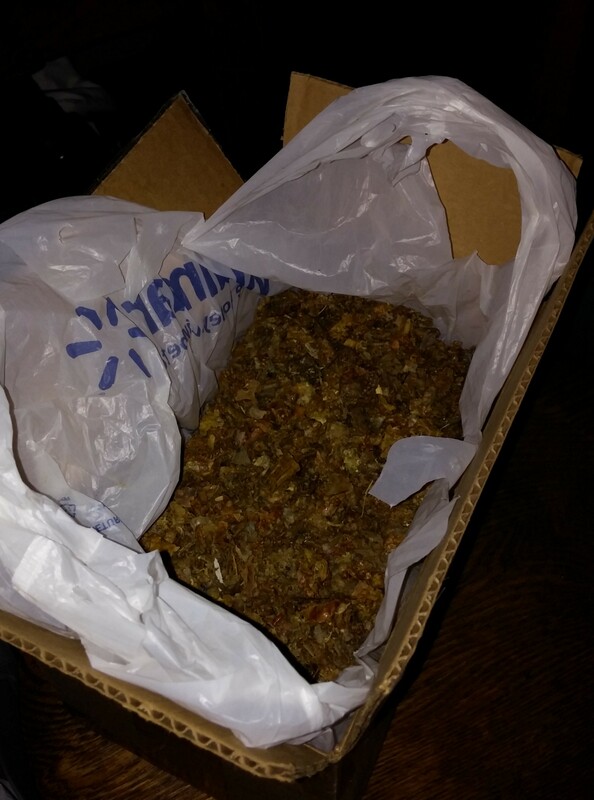 An hour or so later, they were back, with a pain-free, happy child and bought their own supply of propolis products! Another vendor purchased our rejuvenating skin balm (containing propolis) , used it on her sore, tired feet after day one of the festival and shared it with her business partner. The next day, her business partner came by to get her own jar of rejuvenating cream, saying it really soothed their tired, worn-out feet! (Now, we had originally designed this product for aging facial skin – but whatever! If it works, it works!) One of the event organizers bought some Propolis Nose Drops, tried it and came b ack for more the next day. Our friend, Donny burned his tongue on piping hot food last week, and suffered with a blistered tongue for several days, before he remembered propolis! He treated his still-sore tongue with propolis tincture, put up with the burn for a few seconds and then was pain free. He treated the blister for 2 more days, was pain-free, and it cleared up. 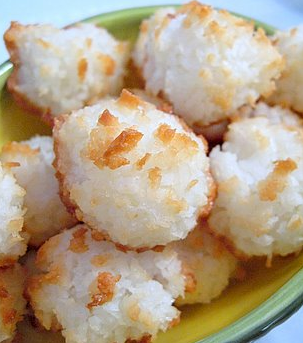 We love these stories and suggestions, so keep them coming. And we love that we get to harvest and share these natural health products with others. It’ll fix you up quick! Yeast infections can thrive when the body is low on probiotics. 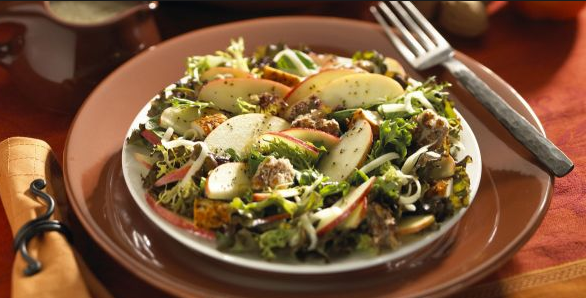 The yeast loses potency in the sustained presence of pinocembrin and acacetin, two flavonoids abundant in bee propolis. Studies show pinocembrin act as a fungicide and bactericide. 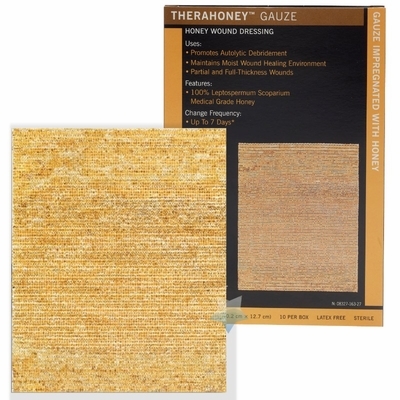 It also has the power to sooth swelling and anesthetize the body so that itching from the yeast infection is minimal. Acacetin has also been shown to reduce inflammation caused by Candida. 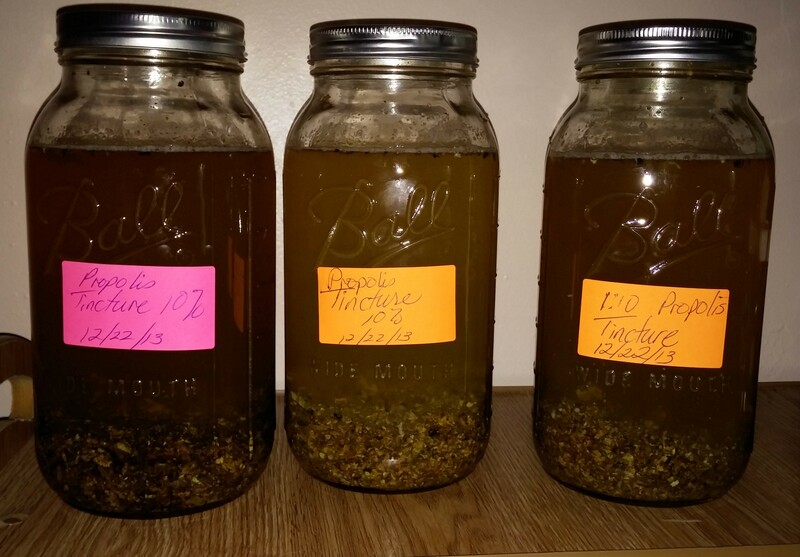 The phytochemicals in propolis typically can clear up a yeast infection in roughly one week. This is nearly equivalent to the duration of prescription drug treatments, which often take one to two weeks to prove effective. Many users of propolis for Candida prefer the natural treatment to prescription drugs. Drugs typically used to treat yeast infections contain fluconazole, miconazole, clotrimazole or tioconazole. These ingredients have been linked to side effects ranging from burning sensations to bad odors and increased itchiness. Propolis for Candida often has no negative side effects, but may trigger allergic reaction in people allergic to bees or certain types of pollen. To treat yeast infection, use an extract form of propolis topically rather than orally. 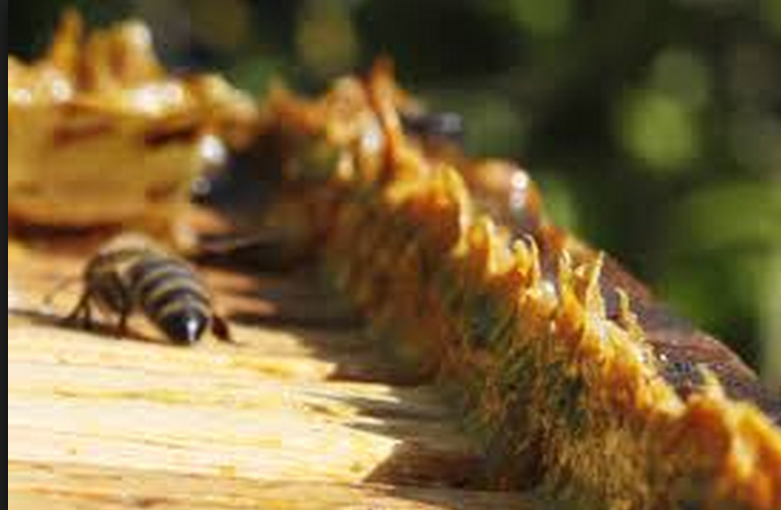 Ingestion of propolis can often work, but studies mainly support targeted topical application. Apply the propolis extract or salve to the area infected by Candida, three to six times a day over a period of about a week. A propolis extract cleared thrush, an oral yeast infection caused by Candida albicans, as effectively as the standard antifungal medication, according to Phytotherapy Research (2005;19:652–4). When a yeast infection occurs in the mouth, a condition commonly known as thrush, it is usually caused by the organism Candida albicans. Thrush is most common in infants who have immature immune defenses; it can also occur in people who have diabetes, those with poorly fitting dentures, and people with a weak immune system due to cancer, Crohn’s disease, AIDS, or other serious illnesses. Some people experience thrush after taking antibiotics, since these drugs disrupt the normal mouth flora and make it easier for candida organisms to multiply.https://beepothecary.wordpress.com/wp-admin/post.php?post=798&action=edit Certain medications such as steroids and chemotherapy drugs also weaken the immune system and may increase the risk of developing thrush. In addition, Characterized by white patches on the tongue and insides of the cheeks that can be easily scraped off, the infection can spread to the palate, gums, throat, and eventually the respiratory and digestive tracts. Eighteen adults with thrush due to poorly fitting dentures participated in the current study. Six were treated with nystatin, and the remaining 12 were treated with an extract of propolis. Both groups were instructed to dry the infected area of the mouth with a swab and apply either the nystatin or the propolis directly to it four times a day. After 15 days, the infection had disappeared in all people in both treatment groups. Swishing propolis extract in the mouth 3-5 times a day, or adding it to a saline mouth rinse, will clear the oral thrush infection. It also helps clear up canker sores, by applying directly to the sore several times a day. Preliminary studies show that propolis might be an effective treatment for thrush and, moreover, it appears to be as effective as the antifungal medicine nystatin. Controlled trials are needed to confirm these findings. It is noteworthy that many reports exist of allergic reactions to propolis. People should apply propolis to a small area of skin before using it in their mouth and discontinue use if a rash appears within 24 hours. Another study, entitled, “Antifungal activity of propolis on different species of Candida”, was carried out to test propolis on over 100 different strains of Candida, which causes yeast infections. Patients who used a propolis tincture showed a decrease in the number of Candida.